In a memorandum titled “More than Quality” the Dutch Arts Minister Halbe Zijlstra has announced savage cuts to the country's arts budget. Among media arts & technology organizations to lose their structural funding are such long-term friends and partners of ours as STEIM, Waag Society, V2, Submarine Channel, and Mediamatic. This means that pretty much the entire field of internationally focused and future-oriented innovation, education, and development, which has distinguished the Netherlands for many decades, is to be demolished practically overnight. I hope you will consider joining me and sign the petition - but first let me give you an example of what's at stake. I received two books from The Netherlands this week which are good examples of the kind of work that will disappear if these cuts go ahead. The first of these, in the 'Open' series, is entitled (Im)Mobility - Exploring the Boundaries of Hypermobility. It's a project of the Foundation for Art and Public Domain, or SKOR. As described in her introduction by Jorinde Seidl, the book is about 'the search for an alternative lifestyle that is no longer dominated by speed and continuous mobility'. Essays in the book, which is edited by Eric Kluitenberg, and include an interview with the social geographer David Harvey, describe the ways that advanced communications technologies are enabling an increase in physical and motorized mobility for some people and commodities - but that these accelerating flows stand in sharp contrast to the experience of a growing proportion of the world's underclasses. For them, harsher border regimes, surveillance and identity control are being intensified at a rapid pace. 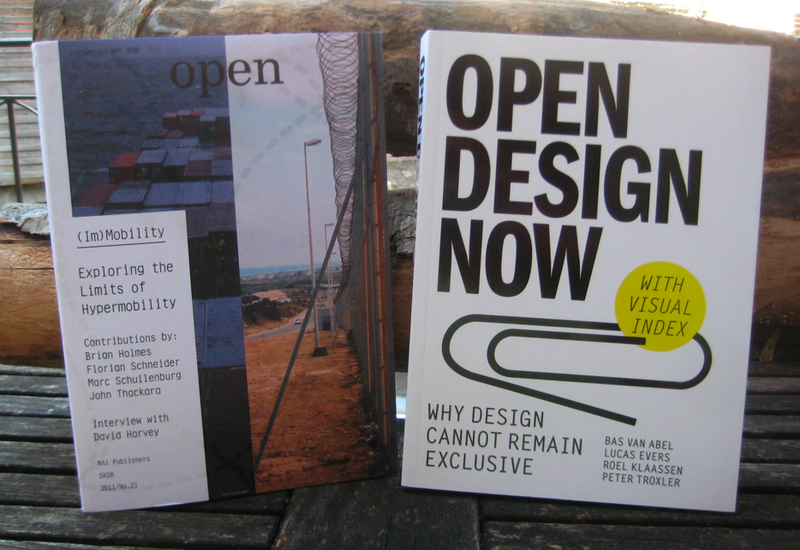 The second book, Open Design Now, is a project of Waag Society and others. It includes essays, cases and visuals on various issues of Open Design. The book contains examples of Open Design that range from RepRap and $50 prosthetic legs, to the Instructables Restaurant. [I contributed a short rumination on the aristocratic Russian anarchist Peter Kropotkin]. The Dutch arts minister argues that 'the market' can surely fill the gap left by the disappearance of state funding for the small organizations that created these books. His argument is at best disingenuous and at worst a bare-faced lie. [See this article reality check about business funding of the arts]. Commercial publishers are themselves struggling to survive and there is no prospect that they will take on this kind of edgy, critical project without some kind of support. It can seem futile just to sign the petition. Please at least get hold of the books and then judge then whether this kind of work deserves to disappear.